The Front of the Ramirez shop! In 2015 I went to Spain to visited the Legendary workshop of the Famous Ramirez family. Currently they don't make guitar there anymore. Instead they have turned it into a small Museum. In this Museum they have some very interesting and historically important guitars! Some of Master Ramirez's early guitars. 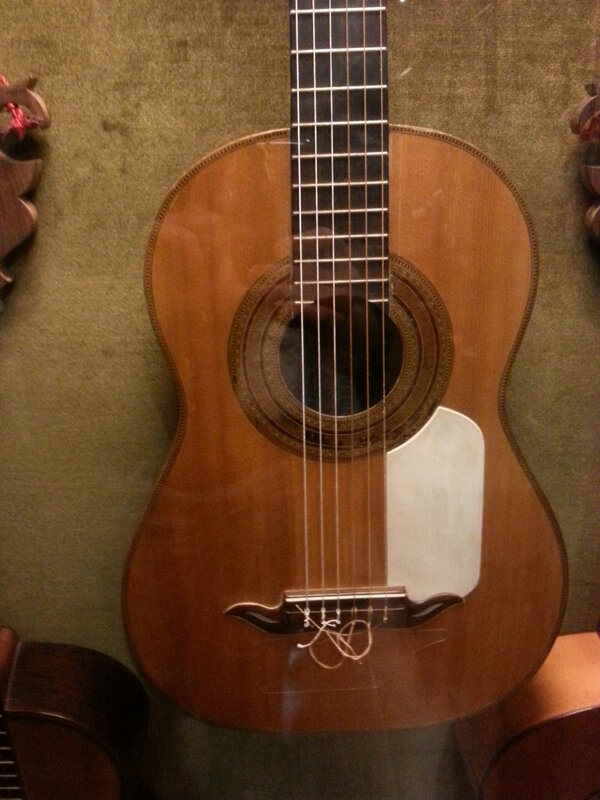 They even had an Original guitar made by THE Almighty "Antonio de Torres". Which for a long time was the earliest guitar known to have been made by Torres. Also a very importent "Francisco Simplicio" guitar. A guitar made by "Domingo Esteso". And a very rare "Juan Pages" baroque style guitar. The Almighty Antonio de Torres. Some of the guitars there! In the middle we see the "Antonio de Torres". The headstock of the Legendary Domingo Esteso guitar, With a hole in the middle! Among the guitars, there was a Lute! By Jose Ramirez III. The Juan Pages Baroque style guitar.